← We Do! We Did! So I encountered another DIY in my Pinterest travels that I just HAD to try. Now all other DIY projects I have tackled (with the exception of the flowers, so I’m leaving that to my mother, the paper flower master) have come out wonderfully, so my track record had to end sometime right? So why am I putting this DIY up here? Well, because I believe it works, I just had some bad luck with it. It did work…for the most part. This is a good lesson for me to learn though. When creating lovely things for your wedding, unless you are Martha Stewart herself, you are bound to mess it up at some point. I’m sure even Martha has a bad day every now and then…right? 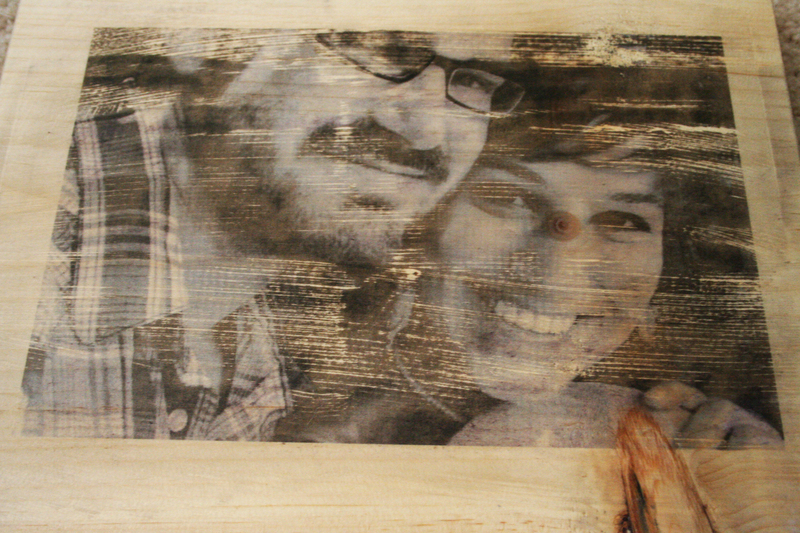 So I am going to show you how I transferred a picture of us onto wood…and how it really turned out. I am all about honesty here. And until this wedding came about, I never crafted, so obviously I am no expert! 1) A lovely picture of the two of you! It can be black and white, it can be color…not sure how well (if at all) color pictures turn out…try it and let me know! 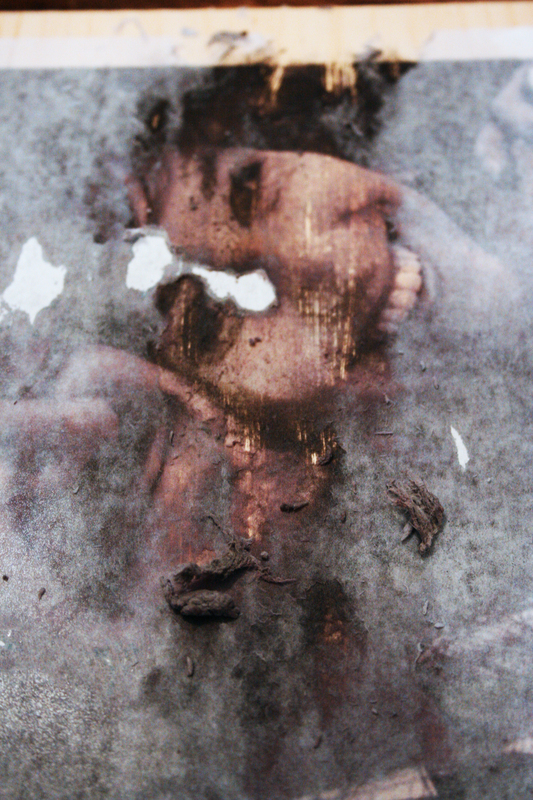 I printed out picture out on my ink jet, which seemed to be fine. It is important to note that if you don’t make your picture span the whole paper, there will be a boarder around your picture in the end. 2) A block of wood the size of a piece of paper. I got a 4′ block of wood cut down to 4 separate blocks paper size. 3) Gel Medium…I’m not kidding…that’s what it’s called. I seriously thought it was a joke, the words “Gel Medium” are so generic…but you can’t go wrong, just Google “Gel Medium.” You don’t need a lot, but the cheapest smallest size I could get was still $6. This project has been the most expensive so far. 4) Mod Podge, Matte Finish. I heard this is a crafting MUST HAVE, so I was bound to buy it sooner or later. This stuff is PRICY! An 8oz jar cost me $12! There is a way to make it homemade style…but I was lazy…If you want to try it, the link is here. 5) Sand paper (optional) If your block of wood is pointy or flaking off bits of wood everywhere, you might want to sand down the edges. I did, just to make it all look rounded. 6) Sponge brush. I’m sure you can use a regular brush too…this is just what was around. 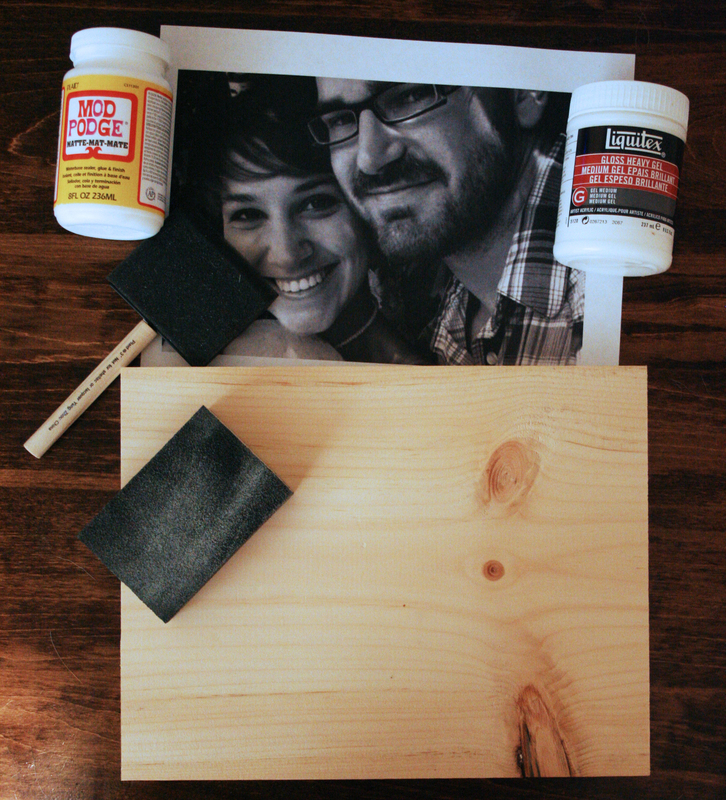 Alright, so after you’ve sanded (if you wanted to), pick a side of your board and paint on a thin coat of Gel Medium. Now the amount of Gel Medium needed is sort of ambiguous. I think a little goes a long way here, and you certainly want a smooth coat, but I think I could have put more than I did. First mistake. Now for your picture placement. Make sure that’s exactly where you want it…because once you put it down, it’s not going anywhere! Next, smooth out all the bubbles. 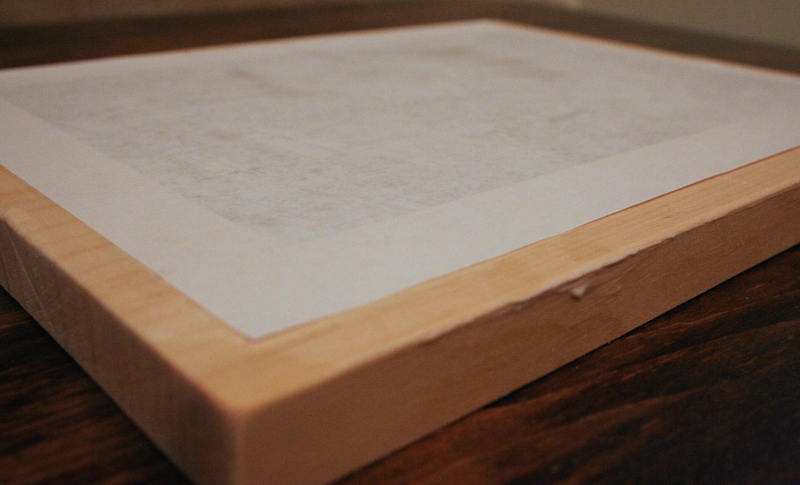 It’s important that all of the paper is pressed against the wood firmly. Now we play the waiting game…24 hours to be exact. The Gel Medium needs to dry completely and so put this block in a place where it won’t be disturbed and go and do fun things for the next 24 hours! Once you get back from your 24 hour party, go grab your block o’ wood, some water and a dish towel of some sort. 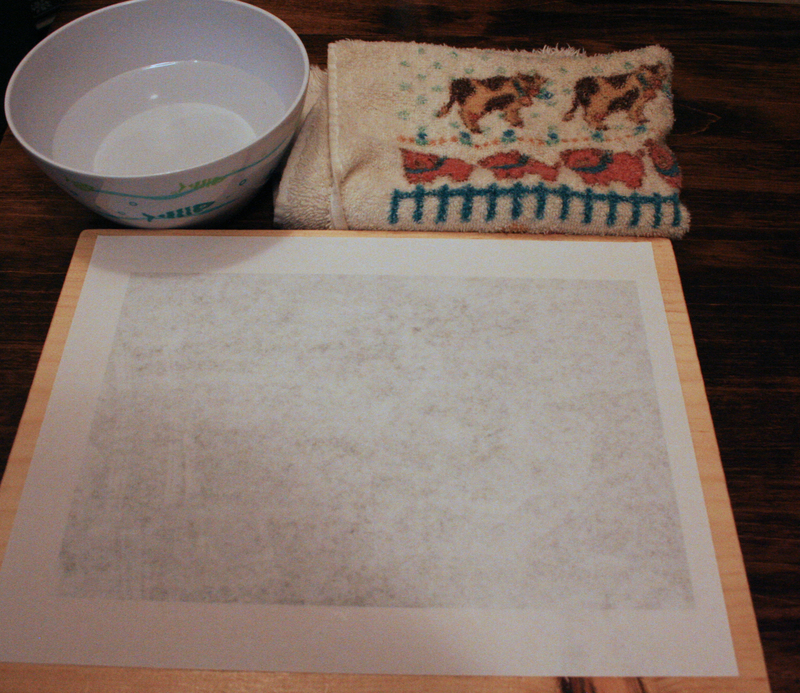 Now soak part of the dish towl and wipe it all over your paper. I mean get this thing soaked! Now use your hands to sort of peel the paper off…in shreds. It’s ok to have it basically disintegrate under your fingers, in fact, that is exactly what you want. You can use the dish towel for this…I did…but I found that your hands are more effective and your dish towel sort of becomes ruined. 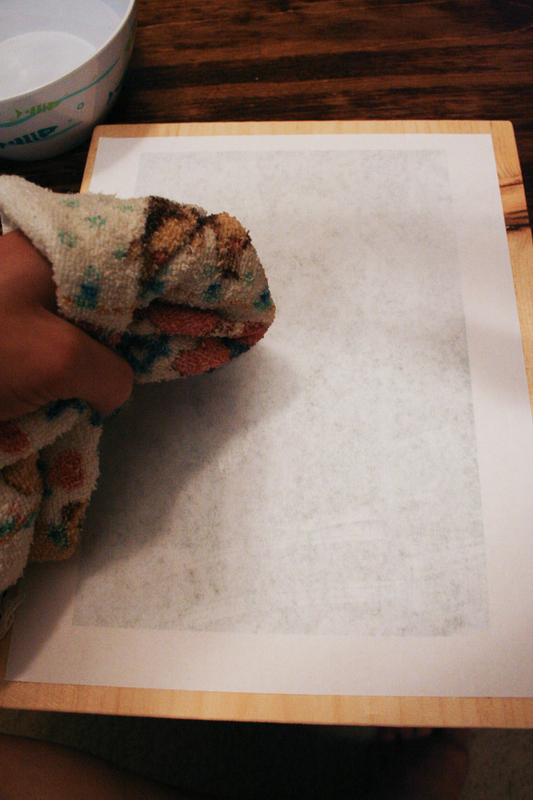 Keep wiping the paper away until it’s all gone, but be careful not to scrape too much otherwise the picture can get scraped off as well! This is a delicate balence…one that I didn’t do so well with. In fact, I scraped away 90% of my hubby-to-be’s right eye! I did a little bit of a patch-job by re-applying the Gel Medium, and JUST putting that eye down. Sadly, it didn’t help too much, he has a more distinct formation where his right eye SHOULD be, but you can hardly call it an eye…wonderful way to start our marriage…I’ve already poked his eye out! 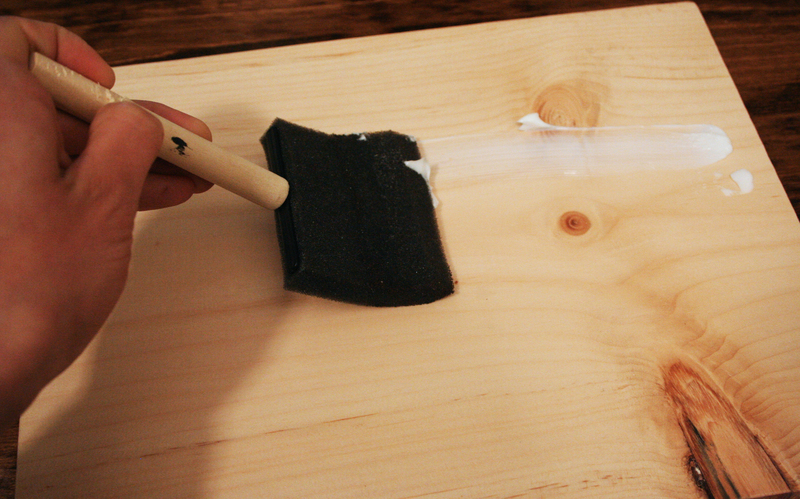 After you’ve scraped off all the paper, let your board dry. 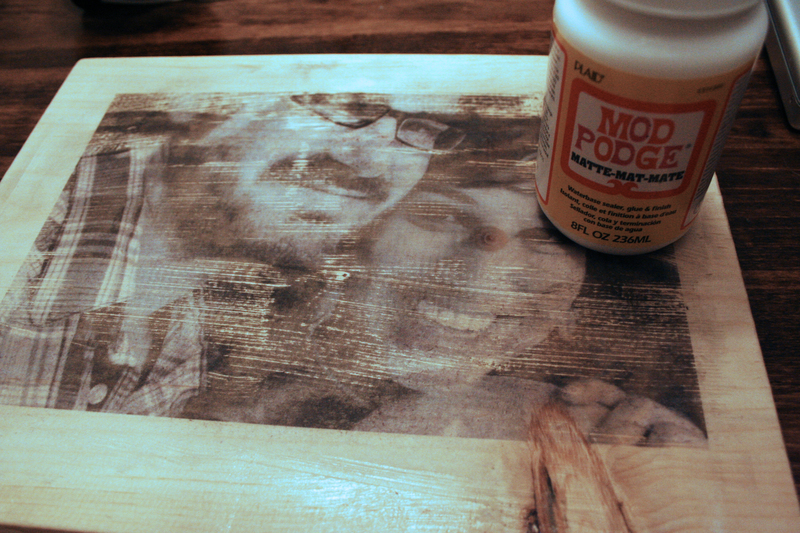 Now you are ready to Mod Podge it! Apply a thin coat of Mod Podge, let dry and that’s it! When you are placing your picture…watch where the wood knots are going! But to be honest, all in all, I liked the way it turned out. It’s quirky and weird and fun, like us! If your homemade stuff doesn’t come out like you thought it would, don’t worry! Just learn to love it, or re work it into something new and better! I am having a blast doing all these projects, even if they aren’t perfect! Sound off guys! Have you had any DIY disasters? Wow it looks easier than I thought it would be. I wonder how well it works on darker wood. Or does it need to be on that light wood? Based on what I experienced the light wood would work best. 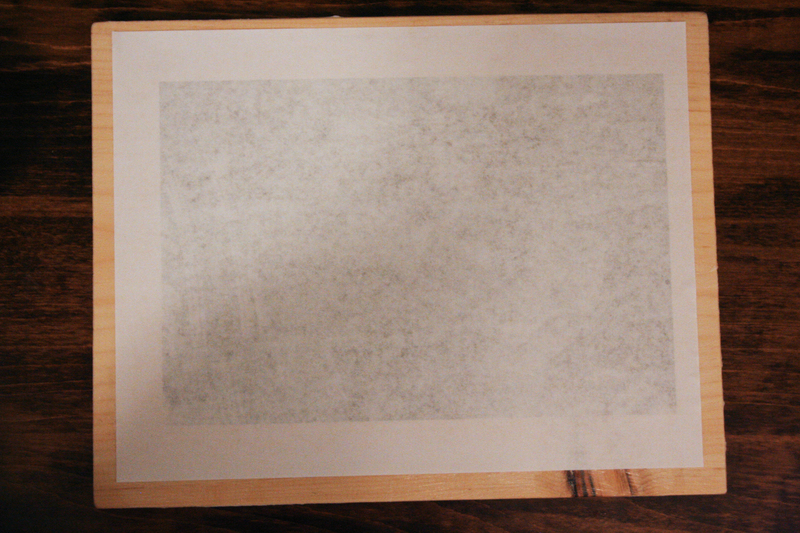 When you wipe the paper off, some of the picture comes with it, which is what gives it its rustic look. I think the picture would be sort of lost on the dark wood. It was easy in practice but you run the risk of losing parts of your picture. Tread lightly! Thanks! I knew I didn’t use enough Gel Medium! I did up the contrast of the photo to make the blacks blacker, and I think that really helped. I do like the result (even if he is missing an eye) so I’ll definitely do more!